Twist and break a corn from the stalk, dip it in hot soup or slice it, slather butter and enjoy it plain or relish the bread with home made jam. This is how the cornstalk bread was enjoyed when I made this sweet yeasty bread last week. Cathy has been a great guide in helping me understand the right technique of scoring breads. 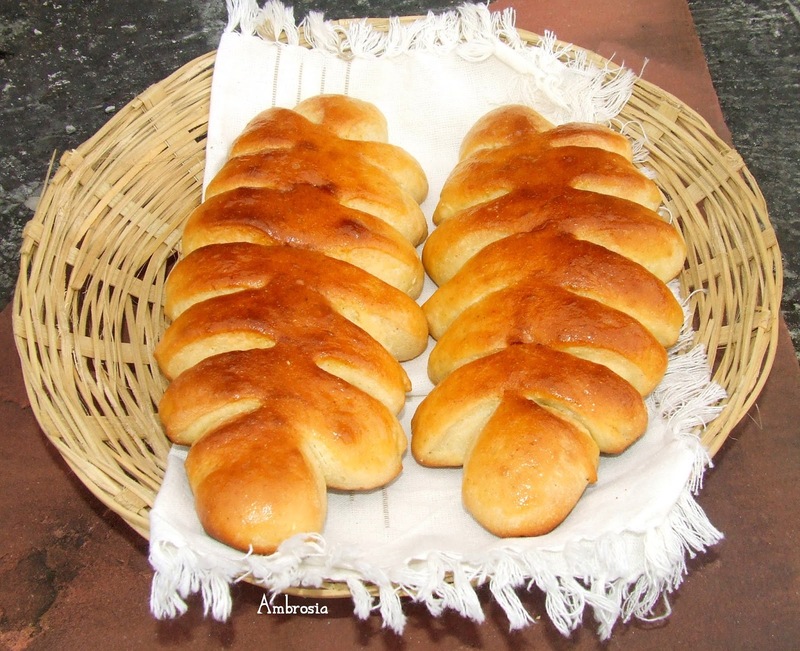 There are some great bread recipes in her site. 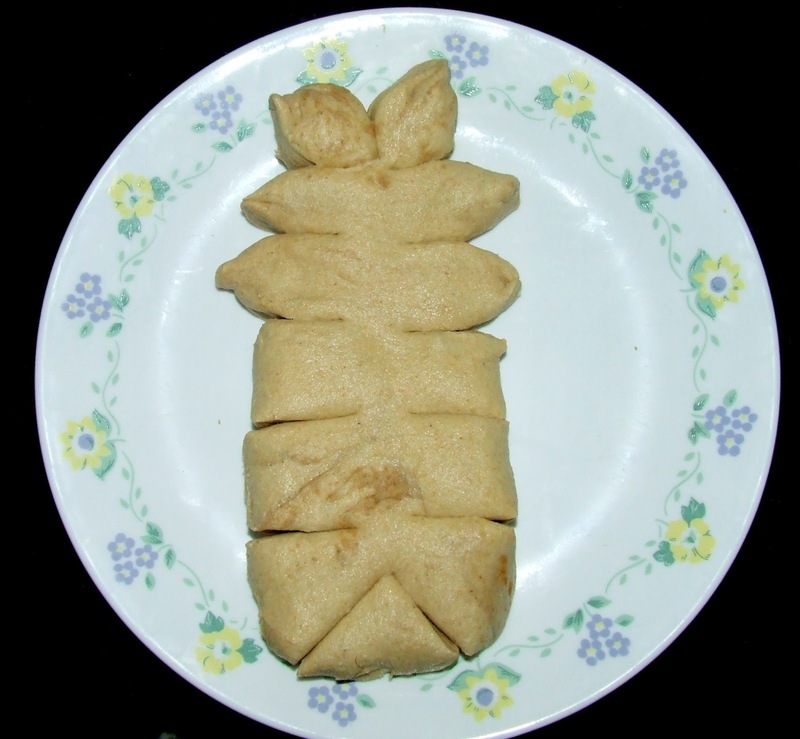 I fell in love with the cornstalk bread when I saw its unusual shape and since I had a lot of cornmeal at home, I got down making this bread immediately partly due to excitement of shaping it and partly excited to know kids’ reaction when they would see a cornstalk shaped bread on the table. 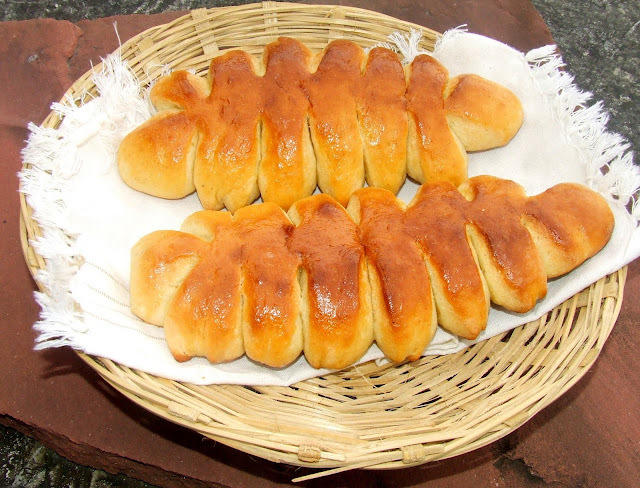 The bread resembles a cornstalk, where each roll or “ear of corn” is twisted and separated from the stalk and eaten. Cathy’s cornbread is crusty while I preferred soft bread. I also increased sweetness as we love our breads a tad sweet. The outcome was sweet yeasty bread. 2 teaspoons vegetable oil to grease the bowl and baking tray. In the meantime, whisk together all purpose flour, ½ cup cornmeal and salt. Add sugar water mix to flour mixture and knead dough. Keep another one cup of warm water handy and add only as much required to get soft dough. Knead for 6 to 8 minutes till the dough is smooth and elastic. Transfer the dough to an oiled bowl. Cover and let it rest for 20 minutes. 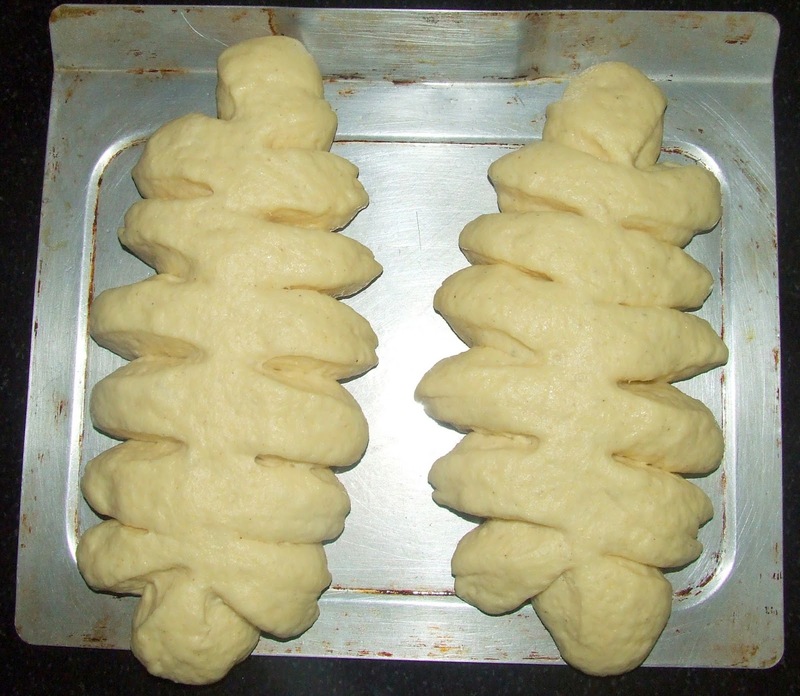 Deflate the dough and knead again for 6 to 8 minutes. Roll out the first part and then fold to get a long roll. Flatten it to get a rectangle about 12 inches long. Sprinkle the remaining 2 tablespoons of cornmeal in the greased baking tray. Place the dough in the center. Make 3 inch long diagonal cuts on either sides or alternating sides about 1 ½ inches apart using a sharp knife or scissors. End of the cuts should not touch, thus maintaining a center stalk. 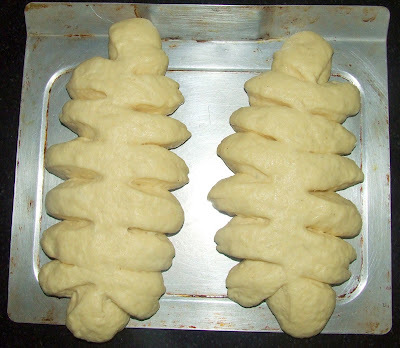 Gently pull apart cuts to stretch the dough and shape the “ears”. Repeat the same with the other part of the dough. Bake in the pre heated oven at 210 degrees C for 20-25 minutes till the bread turns golden. 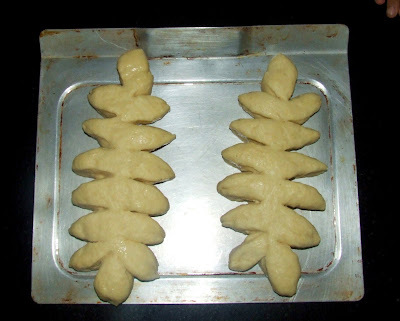 Remove from the oven after 5 minutes, apply some olive oil on the bread, transfer to the rack to cool. Oh My God! That is such a pretty bread. What lovely colour you have got there Namita. This is it.. I am trying baking bread with cornmeal today!! Been postponing it too long. Sure the kids must have loved it! Namita - you mentioned honey water mix in the method, but missed mentioning it in the ingredients. How much honey is needed for this bread? Or is it a choice between honey or sugar? Thanks a ton Nandita, for bringing this to my notice. Original recipe uses honey. To make this bread vegan, I used sugar. But honey was in my mind and hence the error. I have made correction. You may use any of the two in same quantity. This is by far the prettiest bread I have seen. 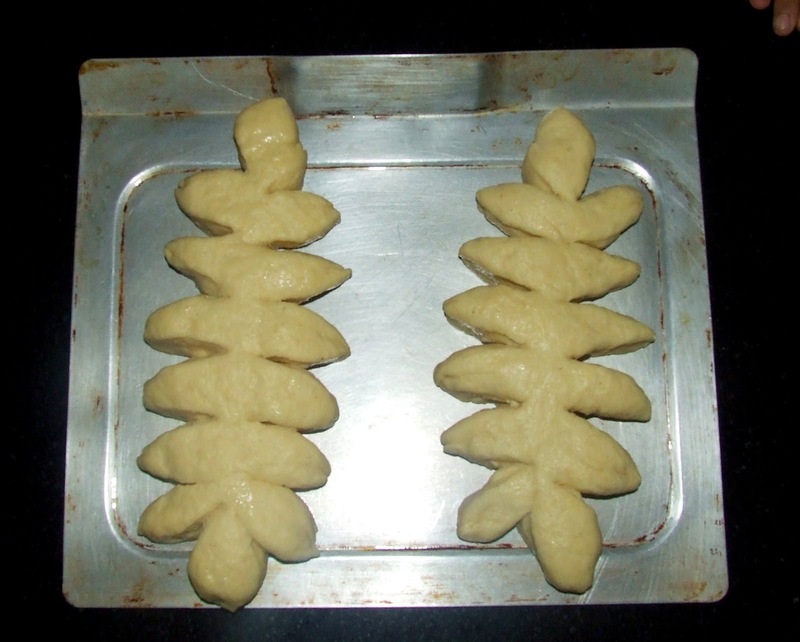 Way to go Namita, love the way you keep bringing such amazing breads to us. Very soon, your blog will be my Bread Bible. Sorry I haven't commented in ages, we just finished a particularly hard study unit and I can finally get back to my RSS Feed Reader to read all my back posts. 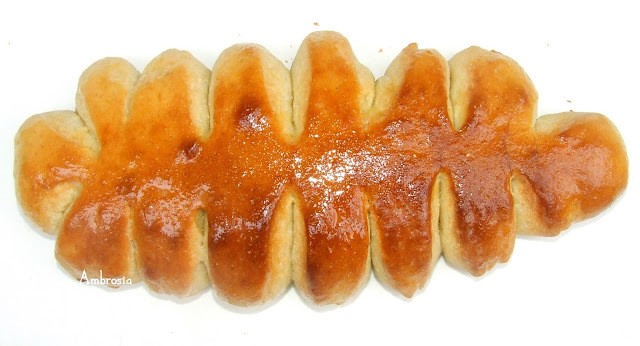 This bread looks wonderful. I love the shape and it looks like it would be amazing with soup.